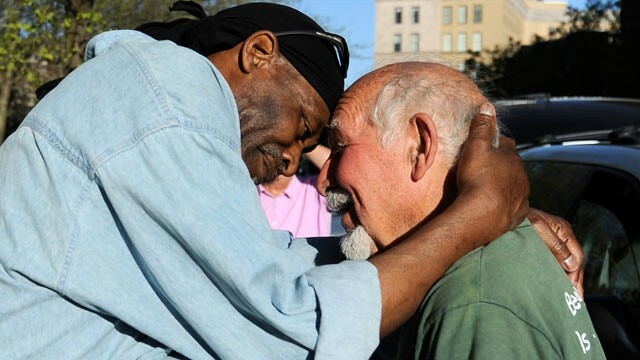 Anthony “Joe the Barber” Cymerys started volunteering at homeless shelters in Hartford, Conn around 1988. Around that time, he met a heroin addict who looked as though he needed a haircut, and Anthony decided to help him out. Ever since then, he came up with an idea to give free haircuts to the homeless in the area. 25 years later, Anthony is still giving out free haircuts every Wednesday in the city park to those who need them. The haircuts aren’t totally free though…Anthony requires that you give him a hug in return. Anthony’s friends have also started to hand out food to the needy after they receive they haircuts. Last year the city honored Anthony for his humanitarian work. Thank you Anthony for all you do!